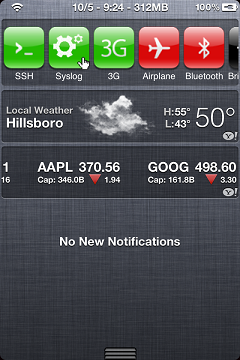 I have a lot of big changes coming to SBSettings for iOS5. For those of you on iOS5 already that want to test it, I should be releasing daily beta updates for it. Your choice of using the old style window or the notification center. Or both. You choose which toggles to appear in notification and window sections. Current sbsettings toggles should be supported. Current themes should work in notification area as well. You get to choose what will show up in notification section. More button row, no more button row, the extra text, no extra text, the dock, the toggles, no toggles at all, or any combination of. The notification area is a limited screen resources so it’s up to you to decide how you want it used. Note, I do not vouch for any stability at this point. Also, be aware that the feature set is not yet complete. To test it, you can add http://thebigboss.org/ios5beta to your repository list. Finally, those of you that are testing this, please send me feedback at my email address as I will not be monitoring comments on the web site while busy developing. I have an ongoing “known issues” list in my changes section in the more app. If your issue is not listed there you could feel free to contact me via email and report it. Works perfect! Just needs the ability to hide Newsstand and we’re all set. can’t get activator to trigger SBSettings in the lockscreen. it’s been enabled. Mabye you should integrate the more button row into the upper toggle row or give an option for do so. I think it will save much more space. In my opinion I won’t omit the more, refresh and power button but I want to have more space to see the other notifications. But really great tweak, thanks! Does this version of SBSetting has a mobile substrate? I hope not! Mobile substrate does not drain your battery. No SBSettings dropdown from lockscreen. I swipe and get nothing but then unlock and SBSettings is open. Not sure if it’s an Activator bug or a SBSettings one. iOS 5 GM on 3GS. Based on user suggestion from email, I am adding it (optionally) to left side of toggles sort of how music controls are in task switcher. You either didnt install the beta in the topic or you didn’t enable it in settings app under notification section. Impossible to know more without any details. How about including open applications in sbsettings so we can do multitasking from it directly. Maybee an option to slide once to show the notification center and then slide down again and bring down the sbsettings notification center. In my option one should see the option only when needed.. Thank you. keep up the great job. EDIT….Upon further testing, after a tethered reboot, opening a app takes you to 1/4 screen, just like in the normal non beta release….This didnt happen in the last beta, so just FYI to anybody….respring to safe mode, open app and restart sb. Thanks for the updates – SBSettings is indispensable. 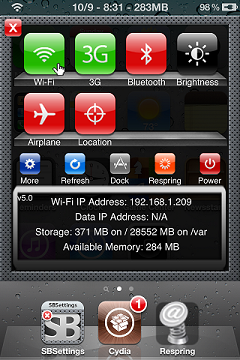 One minor issue – the Location toggle hasn’t worked on my iPhone 4 GSM running iOS 5 GM since the first beta of SBSettings 5. Still not working in today’s 5.1 release. Flipping the toggle doesn’t change the state of Location Services in the Settings app. 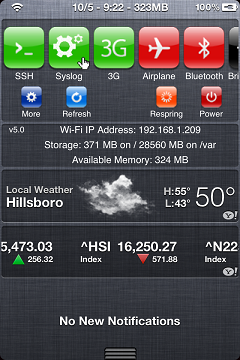 Hi, SBSettings 5.1.3 cause iOS 4.3.3. Crash to Safe Mode after updating. reply / support please. After updating to 5.1.3 my Springboard iP4 FW4.2.1 crashes and goes to SafeMode when trying to enable SBSettings. Please help. ibooks is crashing upon loading. Not sure if it’s SBsettings or something else. Should mention I’m on a verizon iphone 4. After updating Scrollingboard addons my SBSettings are working again!! That’s because it’s on the main BigBoss repo now. Hi big boss, i do love sbsettings but i guess im going to use it until UNTHETERED JB comes out, cant affor to have my phone restarting at random times and connecting it to my laptop everytime. UNINSTALLING SBSETTINGS for iOS5. Please fix all the issues and release a final STABLE version. THANKS!!! SBSettings no longer works on my iPhone 2G. tried reinstalling. Just wanted to say: sterling work! hello, first off all let me thak you for all your work..
Now, i am in ios5.0 jailbroken, and the sbsettings works fine, execpt the location button tha do not turn the location on and off…. hi there, i have it installed on my ipad 2 on ios 4.3, and it works great..! you have to go to settings, notifications turn it on int the notifications menu..
Hi I’ve been using sbs settings on my iPhone 4 for verizon and it has worked flawlessly. Yesterday i downloaded the latest updates for it and now my phone will not allow me to accept call. I can make calls and text normally but when I receive a call the screen freezes. I’ve been searching the Internet to see if it’s a common problem but I haven’t had much luck. I uninstalled sbs settings and it started to work normally, so I redownloaded it and worked for a few hours then started back up with the blocked calls. I love SBS settings and don’t want to stop using it. Any advice or help is greatly appreciated. Hi, all works great but i dont know how to remove the center button in the second row that drops down the top window. I want to have only more, refesh, respring and power buttons. Disable Toggles is off, Seperate list is on and all the buttons inside are on.. I cant activiate SBsettings dropdown window on lockscreen…i was able to do this on iOS 4.3.3.
same for me; location toggle not working on iOS5 (final version). Is it possible to get SBSettings in notification center but without the original SBS window? The Music icon doesn´t appears in the Hide List. Why? I have IOS 5.0. Got stuck with Edge switched ON on my iPad2 after upgrading to iOS 5.0 and now cant use 3G mode. Is there any way to turn 3G mode before any jailbreak will be ready? I couldn’t install Sbssettings on my iphone 4 after I upgraded it to ios 5.0. There is a note : the requested modificaitons cannot be applied due to required dependencies or conflicts that cannont be qutomatically found or fixed. Can you help me out, please? I just (unwittingly) installed this latest update on my iPad2 with 4.3.3. (did not look closely before saying “update”!) Appeared to corrupt everything. The lock screen is shrunk to the bottom corner. The auto-rotate/tilt isn’t working. Icons are all shrunk and mis-sorted. The reboot time is now a few minutes long. And SBS doesn’t work properly. And every app clicked leads to a reboot cycle. Am probably attempting a restore unfortunately now if I can’t get out of it. Please help if can! Upgrade to latest sbsetting and hide the icon and may have click something else. Slide the task bar nothing happens. Activator also no response. Still on 4.3.3. IPad1. Unrelated, see the crap weather in Hillsboro, live right around there..neat. Hey, i have offical apple release of iOS on iphone 4 jailbroken. Installed sbsettings which also installed activator. SBsettings isn’t working at all not in the notification area (in notification settigns sbsettings isn’t even listed.) scrolling finger along top doesnt work either but the program is installed any suggestions? Would it be possible to have the icons centered in notification center similar to how it is in the main SBSettings window? It could be pages of 4 or 5 wide icons. What exactly does the diable toggles switch do under the iOS5 notification center settings? It doesn’t disable the main toggles if thats what it’s supposed to to. Apart from that, great update, really useful! Well done. hi,I just update my iPod touch 4g to official iOs5 and jailbreak it with redsn0w. Then I installed SBsettings 5.2 in cydia. I have tried everything in the SBsetting’s setting and I still can’t integrate it in notification center. Please help! Mixture is out of it can any one help me out? Iph4 jailbreak 4.2.1 sbsettings is making the springboard crash everytime i try to bring down the menu. Also, note a trace of my toggles within scrollingboard. This release seems a little fucked up, althought i deeply respect what youve been coding so far. Back to previous version, no updating as long as you arent fixing those issues. I’m a mid-level noob… How do you go back to a previous version of the install (sbs)? Sorry if inane, I’ve tried searching around here but can’t find. (I’m on a jb’d iPad2 with 4.3.3). Great job, works perfect in version 5.2! Only one thing can make toggles icons still centered in the middle of notification center? is just a visual detail. Thank you! I completely agree with you. Also, I think the iPad version could be more sophisticated and beautiful. Hello, great work.. I love sbsettings…. Can you please update remove background for sbsettings.? I kinda hate have to close all apps one by one…. Is there a SBSettings toggle for disabling Airplay? It’s really an issue when we use a bluetooth carkit and the text (SMS) and Mail sounds do not play trough the phone when the kit is connected. At the moment, we have to manually select Airplay and toggle it off – each time even after a call! Is there a way to tell iphone that the default mode of Airplay is “OFF”? Any help will be appreciated. Thanks. Love the new notification centre integration for iOS5, well done! One thing that really bugs me which I think has been mentioned is that you can see part of the 6th icon. I would look much tidier if you could just centre the first 5 icons and then the second 5 when you swipe right. Also, I can’t find anyway to turn off some of the toggles I dont need on the notification centre??? I’ve figures out the answer to the second part of my question. Even with just 5 toggles, they are set off to the left, centred would be great. I also think it would be good if you could make it so you can pull down the notification centre from the lock screen. RESOLVED – ios4.3.3 on iphone4 status bar issues using sbsettings 5.2.1 and latest activator..
unfortunately this involves alot of time and lots of fu*king resprings!!! but.. this didnt resolve the issue for me so, i removed mobile substrate completely from cydia which removes all your tweaks that use substrate. NB: if you should do this then make a list of tweaks/apps you have installed via cydia..
once your idevice restarts you will find your icons in a mess e.g. not in folders and randomly placed on several springboard pages. thats fine, easy to resolve. Now reinstall sbsettings 5.2.1 which includes the latest version of activator via cydia. Do not install anything else first! With this just installed i got my old way of swiping the status bar to work to show my toggles which all work well. Great!! now run through the list of tweaks you took note of and only and i mean only install tweaks/apps that you use. after each install, check whether your status bar swiping works.. this way you will know which app/tweak is NOT compatible with sbsettings 5.2.1 Its a frickin nightmare but i resolved my issues..
NB: the new version of QuickDo is not compatible for me and disables the use of swiping the status bar on ios4.3.3. Well for me anyway!! so for any of you using ios4.3.3 on an i4 then good luck and hope this works for you! as for the devs, not all of us have ios5 just yet!!!!!!!!!!!!!!!!!!!!!!!!!!!!!!!!!!!!!!!!!!!! i don’t understand all the options and parameters of sbsettings. is there a webpage that explains every single option? Thanx again for this app ! for instance, i would like to see all the toggles at the same time on several rows but i don’t know if its possible. i only found a “max of 2 rows” option. also Activators doesn’t seen to work on my ios5/iphone 4. nothing appears except the first page of the app. sbsettings is very cool and useful anyway, thx again! You either didnt install the beta in the topic or you didn’t enable it in settings app under notification section. maybe you didn’t enable it in settings app under notification section. for my activator pb, i rebooted the iphone, uninstall and reinstall Activator. it works fine now. woohooo ! does somebody knows what the apple killswitch option should be turned on to be disabled? turn the option to “0″ or “1″ ? Hey i try adding the repo and when i do the packages download, but i go to the repo it’s just all blank, like if i misspelled the source. I actually copied and pasted the link so i know it was right. Same deal for me super weird im trying to find a difference source with no luck let me know thank you. I think you should theme it to fit the Notification Center. Great product by the way, first thing I normally install =]. Same here, previous sbsettings works good, but since update to 5.2.1, can’t open it by any means. iphone 3gs, 4.3.3. Please help! Please help! iphone 3gs, 4.3.3, installed SBsettings previously and worked good. Updated to 5.2.1 yesterday, there was a SB icon appeared on springboard and I turned it off as I prefer to open it from the statusbar. But since then, I can’t open it any more, through statusbar or by any means. Activator shows the statusbar was assigned to SBsettings, but just can’t open it. Please HELP! Anyway that I can reverse back to the older version of SBsettings? I cannot get the notification center work. I see “iOS 5+ Notification” inside SBSetting “More” but nothing i can press under this colume. Did I miss any package? I m using IOS4.2.1. Please kindly help. i think there’s a bug with the “fast notes” option. i used to use it a lot but it often doesn’t work. i don’t use anymore but i guess you’ll fix this very soon. thx again ! the set toggle function doesn’t seem to work, i can’t decide which toggles to leave on the notification center. I am mobile service man can u gave my a job my mobilnumber Is 9986599870 I am pure fam..
ipod 4g ios 5 activator isn`t working:I open for ex everywhere and there is nothing! In sbsettings can`t hide icons, make dropdownwindow not in notifications, Sbs options doesn`t work. hello, im interested in some apps, but i dont know how to install it them, please let me know. i got a fatal error after updating to the last sbsetting version. I updated it and after re-springing, my iphone doesnt work. I have tried to reboot it using redsn0w, but it doesnt still work. What´s wrong ? Looks like I’ll have to make use of my backup now. Hi, I got a problem, I’m an iPad 1 – Wifi owner in iOS 5 jailbreaked, so I installed sbsettings and mobilesubstrate, when it was installed it says some errors about scripts of install and ask me for reboot, so I reboot it with redsnow b7 and it don’t pass from the pineapple screen. I guess something got wrong on the install, so I was thinking if its possible to install a custom bundle that fix this, reinstall all the sbsettings and mobile substrate? Thanks, for your attention and I appreciate any help, and sorry about my english, its not my native language. I have two problems with the last release of SBSettings in iOS5. 2nd. The free RAM doesn’t update in Notification Center Widget, never. To clarify, the RAM problem only sucess when I swipe to right to display the more info buttons. If I put on “Info Row” setting, the RAM updates OK. But I don’t want Info Row, I want see the free ram below More Buttons, when I swipe to right. I’m getting this problem with freezing a well. I’m using a 3GS. I accidentally upgraded my version of SBSettings on my ipod 2G for 4.2.1, and now it crashes everytime I use my Activator function. What do I do? i want to know when are you going to update the mms for t-mobile memeber?? I have an iphone 3g 16gb and running 4.2.1 the problem is that sbsettings working very good but today i do something with the hidding and i can open it anymore i try to open it with activator but i try something with activator and gone too so i try to delete it from cydia and reinstall it but nothing open and activator icon doesn’t show anymore.. I am having a similar issue – I just used redsnow to jailbreak my iOS 5.0.1. However, it says that it cannot locate the package…. I jail broke again because I missed SB Settings so much and am so sad that I cannot get it working. please give it a time or try tomorrow. You can try BBSettings for a moment. Thats friggin brilliant! If I had that my phone would work. I had similar problems. Could it be due to jammed up server in Cydia? Just means that there are too many people accessing it? Updated to the Untethered 5.0.1 and now if i have SBsettings installed some apps do not function. “Echofon” Facebook, etc etc. Once I removed only SBsettings it works just fine. im having a problem. after installing sb settings, none of my apps will launch. I uninstall sb settings and my apps work fine. Any suggestions? yes. i did this also. but i would like to be able to use the slide feature for sb settings. PS: AVNEET has reported that to you before on October 26, 2011, at 1:33 pm. 1.Completely redo the jailbreaking process. I’m dealing with the same issue: I turned on 3 toggles, but 8 toggles appears. How can I wiped out with the five ones that I do not want to appears in toggle row? How do i move it from the bottom to the top in the notification center? Couldn’t add repo thebigboss.org/ios5beta to cydia!!! Always error. Sbsettings is brilliant but the only thing what is bothering me is; the toggles aren’t centered in the middle.. It is to much to the left and it makes it kinda ugly. And maybe if there is a possibility to make a theme like intelliscreenX , it would be very awesome. 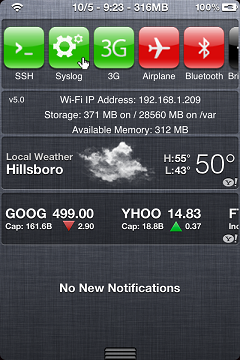 My ipod touch 4g is untethered (redsn0w) 5.01, and some of my toggles on sbsettings don’t work. They are stock standard ones eg: i dont get anymore RAM when i free up memory and the respring toggle doesnt work. Are theses problems with the os or sbsettings? I love SBSettings and have little to none problems with it.. I have noticed that I cannot move the toggles around after installing SBSettings. Anyone have the same issue? i get this exact issue when rebooting after an install, i have to then go safemode, respring again. opening apps goes to 1.4 screen, have to reboot in safemode then respring again.. irritating, hoping a fix soon!? Sbsettings is simply fantastic. Thank you for all the hard work that goes into it. :) it is running perfectly on my iPhone 4 with 5.0.1. There is actually one small issue I do find. It is only cosmetic but i thought it best to give feedback: After installing something from installous, for example, all the hidden icons re-appear and a re-spring is needed. Thanks again. Sbs = A+++++! There is a bug with Fast Notes. Can’t use copy/paste feature there. I found a bug I think. On my sprint 4S, if I use the 3G button it will turn the 3G off and on for a second then it reverts to on. If I reboot after this i get no service until I reset all settings for IOS. @ron Same here on verizon 4S ios 5.01 except I only have to reboot after installing SBSsettings then BOOM, no service. I was able to get service back as well by restoring all settings. I did this after after removing SBSsetting. I hope this helps….. Same here on verizon 4S ios 5.01 except I only have to reboot after installing SBSsettings then BOOM, no service. I was able to get service back as well by restoring all settings. I did this after after removing SBSsetting. I hope this helps….. Thanks for the tip! Was scared there for a minute. apparently sbsettings is att only right now. would love to use the notification center integration part but i’m a bit OC that a part of the next button/toggle is shown (to show that there are buttons on the right side for scrolling?). i would prefer that the buttons are centered instead and no overlapping part is shown. hope this can be added as an option in the next release. Looks like i found a small bug when using the respring button from Sbsetting drop down window. Respring starts but hangs. i need to reboot the iphone. when using the respring button from the notification center, resprings works. Thx anyway for the great work ! Respring and RemoveBG toggles crashes springboard when pressed in the the notification center… No issues on drop down window. In addition, I hope there is paging option for sbsettings in notification center so that you can have a nice view of the first five toggles. Is it possible add thebigboss source from the webpage directly? Now, thebigboss source is empy from cydia. RemoveBG crashes springboarde and respring to safe mode… then, I have to restart againg…. Thank, it work for my 2G with whited00r v5.1. Only disable > respring swipe the dropdown menu come back and after that tried enable all again > respring its come back to work well. Hey – I am new to the jailbreaking scene and SBSettings was the first thing I got. I loved it for the easy access to wifi and bluetooth via the dropdown notifications window. However, what I can not stand is everytime I click a widget (lets say Wifi to turn it ON) the thing kinda slides and you are brought to this new slider to the left with “More” “Refresh” “Drop Win” “Respring” “Power” – and I do not want those.. Is there a way you can simply hide these? So that when I drag notifications down, ALL you see is my four widgets “3G, WiFi, Bluetooth, Airplane” ?? Id love it if the toggles couldn’t slide at ALL …?? Hi, After I update my SBSetting 5.2.2,I cannot change theme of it. Pls. help..
For the notification window, I keep trying to toggle off the last five of my icons, but they inevitably always show up.. :| any help? Did anyone test it on iOs 5.1 ? I’ve got a 3GS old-bootrom, so I could jailbreak untethered even after an update to 5.1 but if I cannot use SBsettings I won’t update.